The building of our new Chicken Metropolis (Chickenopolis) has been an involved and laborious endeavour but nothing is free each and every element of our now extensive and highly evolved permaculture design has had a price and although that price is not always a financial one there is always a price to pay in labour time and resources. The financial cost of Chickenopolis is just 18€ that is for the gate hinges and screws everything else has grown on site sweet chestnut posts and willow whips. We like our interns to have a chance to leave a mark on our site it gives them and us a sense of purpose to their time with us so during our second natural building course in 2015 we had an enquiry from two short stay interns for the same two weeks so Fiona my wife thought it would be an opportune time to build a new winter enclosure for our laying chickens now called Chickenopolis. We have a quarter acre forest garden designed and built in 2009 as a teaching aid for our permaculture design courses and of course its productivity, which is now coming starting to come on well. Chickenopolis is a tweak to our original design enclosing one row of fruit trees and four rows of willow. The willow was planted as both a soil builder and to produce weaving whips and cuttings which we sometimes sell on to other sites. 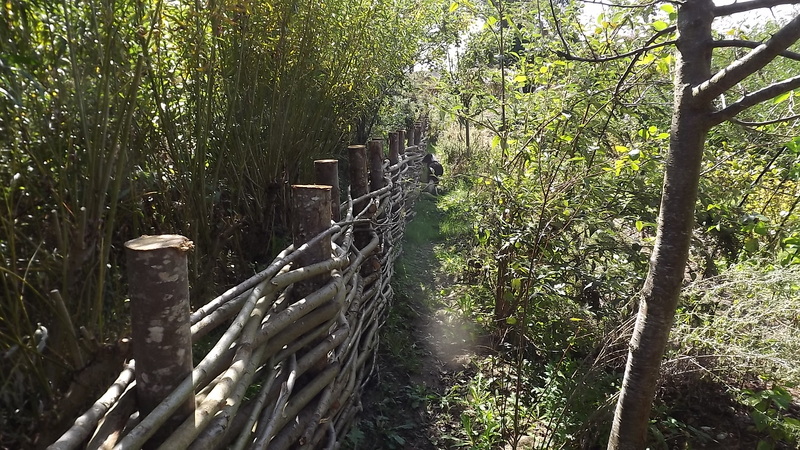 The willow is cut back every winter to a stub leaving the leaf litter and any wood too small for use on the ground to build the organic matter in the soil which is now incredibly rich and dense, so rich and dense we think it’s now ready to support our chickens over winter. The first task is to build a barrier across the forest garden to contain the chickens in just the top third of the space as the rest of the forest garden has an extensive range of herbs, strawberries and Nepalese raspberries which the chickens would devastate if given access to them. We already had the chestnut posts cut and stacked they just had to have a point cut on one end and be knocked in to place Fiona and the interns did this in one day. 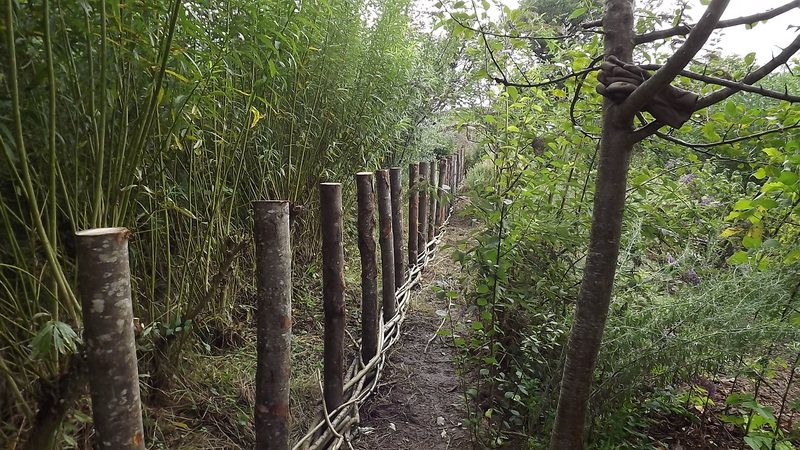 They then proceeded to cut back a willow hedge which bounds our willow biomass plantation for the whips to weave between the chestnut posts. This type of barrier was common place on farms in the past but has lost favour to wire fencing over the years as they are quick to erect and require less skill. Four days later the fence was finished to a metre high and really looking great and rewarding for all involved. 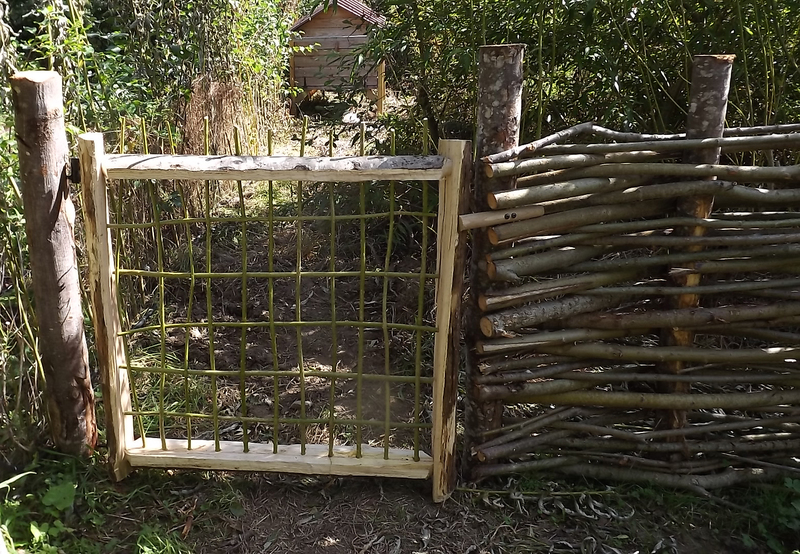 Then once the building course was over I got involved to build the gate from more sweet chestnut for the frame and willow whips from the newly partitioned Chickenopolis. The hen house is one we have been using for a couple of years to follow our cows around the fields to help clean up the cow pats and reduce the fly population. I have been moving them around most of the time and that has been fine but some people find it heavy to move so I will be building three smaller ones ready for next year, more on that later. Now its time to put the chickens in to Chickenopolis and see how they like their new surroundings. 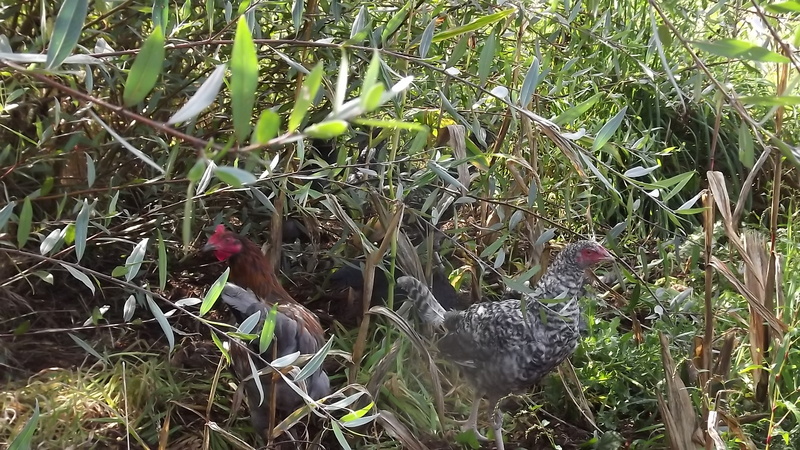 Believe it or not there are eight chickens in there but the dense vegetation hides them so well it’s hard to see, these are chicks we hatched ourselves this year and their older relatives will be added in a couple of days bought back from the fields they share with the cows and sheep. 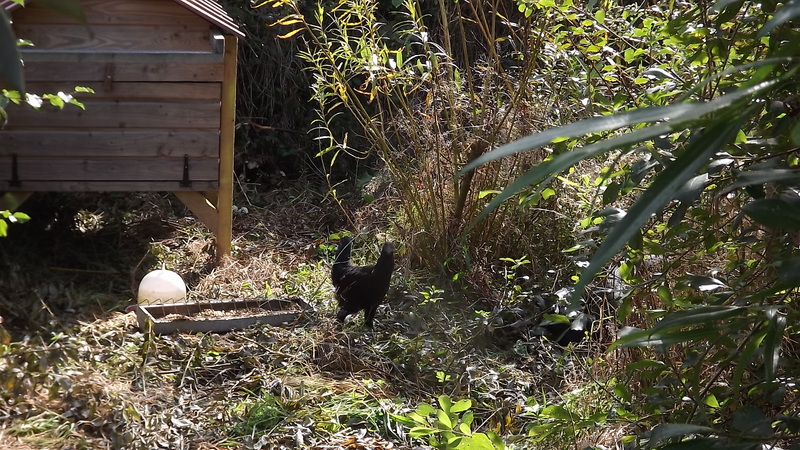 The chickens have now been in their new home for a day and have not touched the grain provided so it looks like our plan is going to reduce our costs as hoped that should repay the 18€ investment this winter. Once the chickens have spent the winter period in this area they will go back to the paddocks to follow the cows for the rest of the year in mobile houses and this area will be seeded with a mixture to provide for the chickens winter food next year. The mixture of seeds will include amaranth, burnet, maize, sunflowers, millet, vetch and clovers all of these will flower and produce seed before the chickens are returned to the area so we can collect some of the seed for subsequent years and leave the rest for the chickens to harvest for themselves.